Early 2016 brought with it the return of a champion. As the topic of every dinner party turned to “will we stay in or will we leave?” The topic of every dinner party that Nicky Henderson went to was, “can he do it Nicky?” Sprinter Sacre was on a comeback trail that so many people thought was impossible but come March, Sprinter would answer the question in the facile manner that only he could. To answer the other question, we voted leave! June 23rd will forever remain in the history books as the day that the British public spoke up and Britain voted to leave the EU. If you were shopping at the Tattersalls Ireland Derby Sale 22nd– 24th June, you might have found that the horses you purchased became significantly more expensive overnight! This is where RacingFX comes in, by providing bank beating exchange rates, free overseas transactions and a simple payment system we have been helping our British clients deal with the repeated blows of Brexit for the past six months. Since then, the Henry Candy trained Limato has been named Outstanding Sprinter of the year at the Racehorse Owners Association awards and Found was inevitably crowned Outstanding Filly of the year following her win in the Prix De L’Arc De Triomphe. The Aidan O’Brien trained 1,2,3 in Chantilly was the toast of the racing industry but October also brought a new topic of conversation; Trump or Clinton? December saw another referendum, this time it was Italy’s Prime Minister Matteo Renzi who stepped down following defeat. A caretaker government is now in place with the possibility of an early election. Fears of another Eurozone crisis and even another referendum on retaining the euro have grabbed headlines and no doubt sent shivers down the spines of European leaders. Each of these political factors have played a part in what has been a turbulent year in the currency markets. The consequences of each vote are yet to be fully realised but as market volatility continues the RacingFX message remains; make international payments when required and avoid market speculation. 2016 has been a year of exceptional growth for RacingFX. The launch of the online Cash Manager has revolutionised the way to make international payments and manage multiple currencies online. The Cash Manager has proved very popular with our customers and further improvements are being made for 2017. This year has also seen the launch of RacingFX Insurance services, covering Bloodstock, Liability Insurance, Home/Property and Motor Insurance. Bespoke Mortgages and Finance solutions are also available through RacingFX, providing a range of services that are perfect for all your money matters. Most recently, RacingFX has formed a partnership with the National Trainer’s Federation providing unique benefits for members through the Cash Manager system and promises of an NTF branded multi-currency payment card in 2017. If you are going racing or just tuning in over the festive period, why not check out our jockey’s blogs. 2016 saw the successful signing of two star names from across the Irish Sea. David Mullins secured a sponsorship deal in March before winning the Grand National at his first attempt, it’s safe to say that his future is bright! Paul Townend is the latest to join the RacingFX roster and he shares his thoughts exclusively with RacingFX in his audio blog every week available at www.racingfx.co.uk/paul-townend and @RacingFX1. David and Paul’s Christmas special blogs will be available on Boxing Day and Wednesday 28th respectively on the RacingFX website and twitter. 2017 promises to be a very big year for Racing FX with big plans for our multi-currency payment cards and introducing a broad range of wealth management services. In addition, we will be expanding our accounting, invoice management and payroll services and our RFX Giving initiative. This generates revenue from online vendors when our clients buy from their store and will donate from this to worthy charities within the equine industry. We have just set up an office in Ireland and are in the process of creating more partnerships with key organisations in the sport. Through these we aim to help people in the industry save time and money with our services. 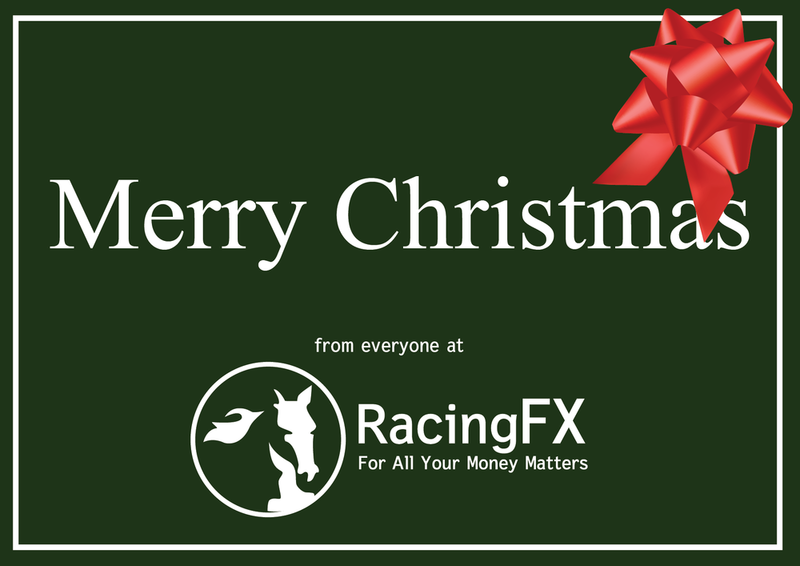 RacingFX provides a secure and reliable alternative to high street banks, we look forward to working with you next year.